Gutter protection comes in all different styles: from cheap, temporary fixes to permanent, clog-free systems. Here is a concise guide to help you compare choices. Screens – There are both metal and plastic screens on the market. Some are harder to install than others, but the real problem is that screens will not stop all debris. This means eventually you will have to remove the screens to get to that debris and clean it out. In other words, you are right back on the treadmill of regular maintenance. The big debris might still be kept out, but you’ll still be regularly cleaning out the smaller debris. Foam Inserts – This is a product that can cause more harm than good. Airborne seeds and dirt can be trapped in the foam and your gutter will literally start growing stuff! Not only that, the foam can cause mold and rot. And many of these foams are not flame-retardant, which can be hazardous. Slit Guards – Debris will still find its way into smaller holes or slits. You will need to remove these guards to clean out this small debris. Brush Insert Guards – Both large and small debris can get stuck inside the brushes. (And also birds are attracted to the brush material as a place to nest). Often the brush insert has to be removed to properly clean gutters. All of these do-it-yourself “solutions” have the same things in common. They cost less, but they will cause you a bunch of headaches with ongoing maintenance. Cons: Not a permanent solution. Can actually do more harm than good and you have to do ongoing maintenance. Requires you to climb ladder to roof and do installation work. This system works on the principle of water tension. Water adheres to the protection on top of the gutter and is guided to flow into a single place – the single ‘drop.’ Debris is kept out because it does not adhere to the protection like water; instead it falls harmlessly away. There are a few concerns with the single-drop system. For one, because it has only one place for the water to drop, it is less effective than a double-drop system – in heavy rain, water ‘fly-over’ can occur. The other problem is that new “solutions” claiming to effectively use a single-drop system are put on the market regularly and it can be hard to know what options are of a high-quality. Not only are many of these systems unproven, but often the installers don’t know enough about them to install them properly. And then what ends up happening is this: the new companies and their new “solutions” are out of business and the homeowner is stuck with the results. Pros: Sometimes better than Do-It-Yourself options. Do your homework and avoid over-priced systems, inexperienced Installers, or unproven companies. Cons: Single-Drop more likely to lead to water ‘fly-over’ (water not getting into gutter). Some systems are over-priced and unproven. Installer expertise varies widely. The Double-Drop system also uses the principles of water tension and the adhesive quality of water – just like a single drop system. But instead of having only one drop built into the system, there are two drops. This allows a maximum amount of water to flow in, while debris stays out. 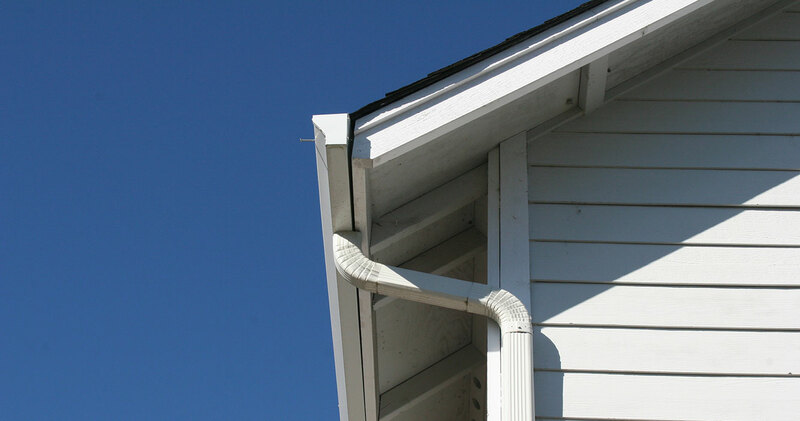 It works like this: rainwater adheres to the “S” design of the gutter protection. Most of the water will flow into the first “drop” (also called a “nose”). The water that does not flow into the first drop can then flow into the other drop (2nd nose). The water adheres and flows in; the debris stays out. We’re proud to say that Gutter Shell is the only ‘double-drop’ system on the market. Other companies would like to duplicate this super-effective and elegant design, but it is patented. Pros: Exclusive, patented design comes with clog-free guarantee. Installation guaranteed to be done right. Solution has stood the test of time and is installed by a proven company. Cons: Upfront costs are more than for Do-It-Yourself Solutions.